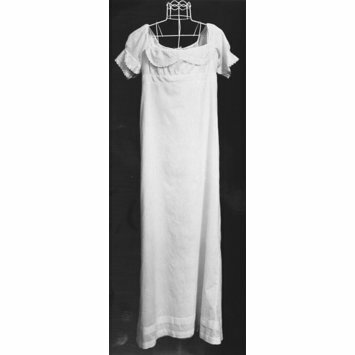 (and other information, from the original registered description): Girl's dress of cotton, with yoke and sleeves embroidered in white cotton. It has a high waist, squarish neck opening with narrow scalloped collar in front, short sleeves, and plain skirt except for double pleat round bottom edge*. It is tied with tapes at the back. The decoration, which is on the front and back of the yoke, on the collar, shoulders and sleeve ends, consists of leafy stem borders and small detached blossoms. Length 3 ft. 3½ in., Width with sleeves 20 in.